For those of you who might be less familiar with The Fuller Center, let me give you a general overview of who’s in that picture — a neighborhood association president, homeowners, volunteers, house captains, nonprofit executives, political leaders, city representatives, church members and youth from the Church of the Nazarene, whose General Assembly coincided with our Legacy Build. 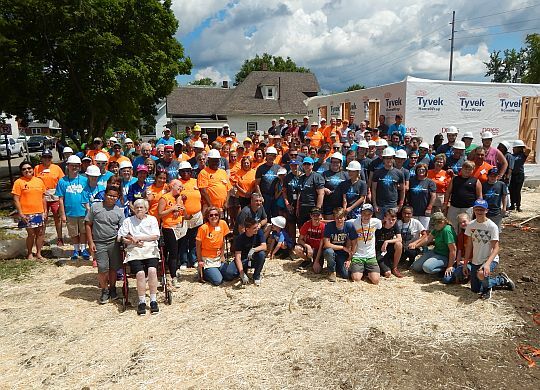 All of these good folks came together in partnership to help five families have simple, decent places to live in the neighborhood of Tuxedo Park, a blitz build that marked a turning point for a once-thriving east Indy area that had been on the decline for decades. No more. You can’t build five homes in a week without a lot of partners. You can’t build 200 homes in Haiti, El Salvador and Nigeria without partners. You can’t build and repair hundreds of homes in Louisiana, Kentucky and Georgia without partners. Building a single home takes partners. That directly explains our partnership with homeowners. They are not charity cases. They work alongside our volunteers and repay the costs of materials on terms they can afford, over time, with no interest charged or profit made. Their payments go to help others in their community get the same hand-up, and in the process they become givers themselves. But we have a multitude of partners beyond homeowners. Because we do not accept government funds (and the strings attached) for building, we rely on the generous partnership of our donors. We partner with skilled and unskilled-but-willing volunteers to build and repair homes, thus keeping the costs as manageable as possible. We partner with like-minded organizations such as People Helping People in El Salvador and Presbyterian Disaster Assistance in Texas. The local groups who do our work in the field in the United States and abroad are not called affiliates or chapters but are referred to as covenant partners. We do not dictate to them how to do their work. We see ourselves as partners with the same mission — to help families in need have simple, decent places to live. Perhaps our most important partnership is with the church. 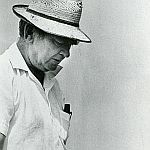 The Fuller Center is not a church but is a servant of the church. We provide a vehicle for churches to put faith into action in a real, tangible, difference-making way. Churches also host teams of Fuller Center volunteers, host our fundraising Bicycle Adventure cyclists across the nation, send team on U.S. and Global Builders trips and often help feed our volunteers. We appreciate every way churches partner with us. Church attendance and affiliation has been steadily declining in the United States for decades. We could debate ad infinitum the reasons for the decline. But at The Fuller Center we have seen time and time again a church become enthused and reinvigorated after tackling a Fuller Center project. Maybe it’s because Jesus was a carpenter, but there’s just something about swinging a hammer and pounding a nail that drives home the importance of loving thy neighbor. At the end of the day, you can look at the structure and enjoy the feeling of a job well done. More importantly, you can look on the faces of people to whom you’ve extended God’s love. That feeling is hard to beat, and it’s something you want to experience time and time again. We are always seeking new partners who want to express God’s love by helping families have simple, decent places to live. If you want to know more about how you can partner with The Fuller Center for Housing, be sure to email us or call 229-924-2900.